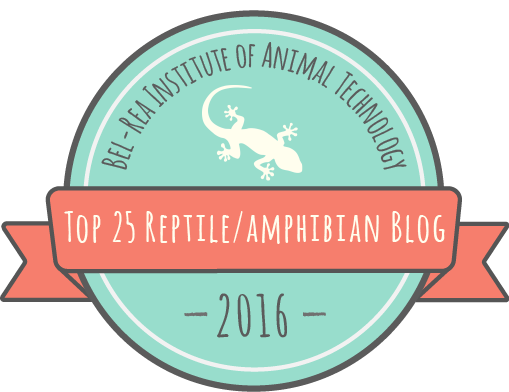 Reptiles have been moving around the globe for a long time, often assisted by humans. Skinks and geckos had dispersed to the remotest Pacific islands by about 1600 BCE, at least partly thanks to the aid of the first human colonists of those regions. Brown Tree Snakes (Boiga irregularis) were brought from Australasia to Guam during World War II. In more recent decades, Burmese Pythons (Python molurus) have reached the Everglades, California Kingsnakes (Lampropeltis californiae) the Canary Islands, and Indian Wolf Snakes (Lycodon aulicus) the island of Mauritius in the Indian Ocean. In many cases, these introduced populations of snakes have become invasive, disrupting the native ecosystem in numerous ways, mostly by eating their way through populations of native prey. The indirect effects of these dramatic population declines are unpredictable and profound. For example, on Guam the loss of native forest birds as a result of snake predation led to an explosion of spider populations, with a 40-fold increase in the number of webs compared with nearby islands without invasive snakes that still harbored a native bird community. Although species have been colonizing new ecosystems for a long time, the rapid rate at which they are now being facilitated by global trade is a serious ecological concern. But how new is this problem, exactly? Where was the first recorded population of introduced snakes? Incredibly, three species of snakes were introduced to the Balearic Islands in the western Mediterranean as far back as 2200 years ago. Having won the Second Punic War, the Roman Republic was expanding west into the Iberian peninsula, which they had taken from Carthage. As a result, transport and trade between the western and central Mediterranean were more regular than ever before, which may help explain the introduction of several species of amphibians and reptiles native to either the European or African mainland to the Balearics. The native people of the Balearics had served as mercenaries under both Rome and Carthage and were renowned for their skill with the sling, but Rome conquered their archipelago anyway shortly after the war and purposefully settled over 3,000 Spanish and Roman colonists there. It's likely that many of these people, understandably, missed their mainland homes, including the native plants and animals to which they were accustomed. They probably brought pet chameleons and tortoises with them, and surprisingly, keeping snakes as pets was also common, so they may have purposefully or accidentally introduced snakes from mainland Europe and Africa for this reason. Their name reflects their dorsal pattern rather than their climbing prowess. One species, the Ladder Snake (Rhinechis [Elaphe] scalaris), is endemic to the Iberian peninsula. It is a large, adaptable snake that eats mostly small mammals, similar to a North American ratsnake. Although it is easy to see how these snakes could have stowed away on ships, perhaps boarding to eat rats or mice that fed on grain or other goods, it has also been suggested that the Ladder Snake was introduced partly because it played a totemic purpose in mythology and religion. People encouraged non-venomous mammal-eating snakes to take up residence in and near their homes to keep populations of rats and mice under control, and having snakes around the home was thought to maintain the sexual potency of the home's male inhabitants. There is also some evidence that mammal-eating snakes were gathered up and released in areas where epidemics were rampant to help control rat or mouse vectors. This may have led to the association between the Roman god of healing, Aesculapius, whose staff is still a symbol of medicine today, and the Aesculapian Snake (Zamenis [Elaphe] longissimus), a relative of the Ladder Snake. 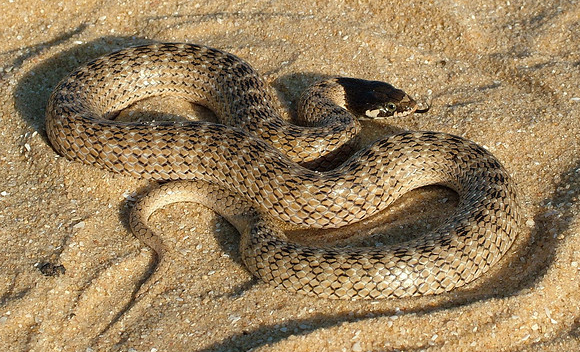 A smaller species, the False Smooth Snake (Macroprotodon mauritanicus [formerly cucullatus]), is native to northern Africa and southern Spain, where it preys upon small lizards. It might have been introduced to the Balearics accidentally, but no one is really sure how it got there. Apparently, False Smooth Snakes are at least partially responsible (introduced weasels, cats, and genets probably also contributed) for the extinction of an endemic species of lizard, Lilford's Wall Lizard (Podarcis lilfordi), a ground-dwelling, frugivorous species that once dispersed the seeds of a perennial shrub, Daphne rodriguezii. Since the wall lizards began to disappear from the large islands of the Balearics about 2000 years ago, the plants have suffered from a lack of seed disperal, a service formerly provided by the lizard, which would eat the fruit and crap out the seeds. On tiny offshore islets this relationship is still going strong, but on Menorca and Mallorca, where there are many snakes and no lizards, seedlings of D. rodriguezii sprout only underneath their parents, a losing strategy for a young plant. Finally, the Viperine Watersnake (Natrix maura), a semi-aquatic natricine native to both southwestern Europe and northwest Africa, was introduced to both Menorca and Mallorca in ancient times. During naval battles, both the Phoenicians and the Carthaginians apparently used to throw open jars full of snakes into enemy warships to cause panic among the combatants (apparently even back then nobody could tell the difference between venomous and harmless snakes), which possibly led to or reinforced its populations on the islands. 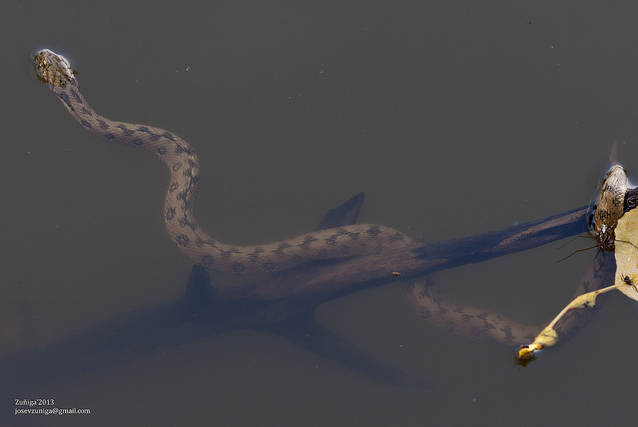 In the Balearics, these watersnakes eat endemic Mallorcan Midwife Toads (Alytes muletensis) (which they consume with impunity despite the frogs' toxins thanks to the snakes' immunity to a wide range of toxins), so a program of active eradication within the range of the frog has been enacted. The Viperine Watersnake could also have been responsible for the extinction of other endemic species of midwife toads never described but historically present. Snakes may actually be some of the most problematic potential invasive species because they are difficult to detect and almost impossible to eradicate. 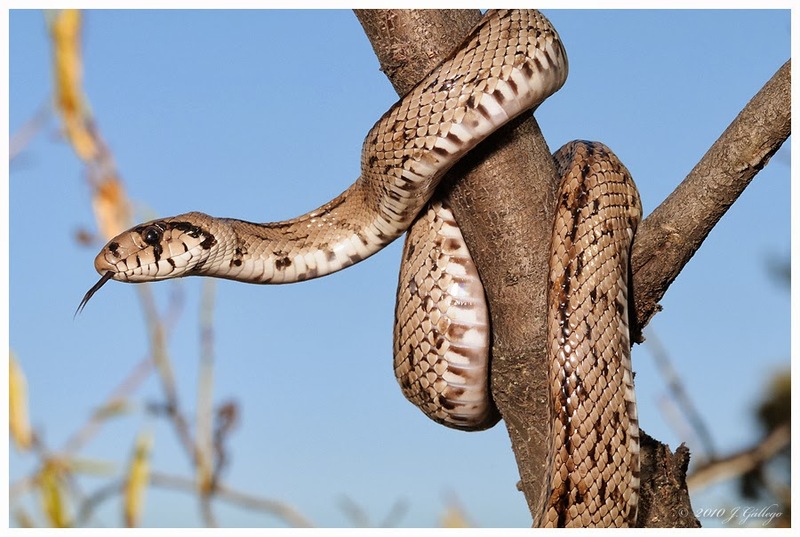 Research has shown that if you're going to stop an invasive species, you had better stop it early or not at all, a tall order in the face of snakes' impressive crypsis and secretive behavior. Snakes' low energetic requirements allow them to persist through lengthy periods of resource scarcity, and their flexible metabolism allows them to quickly take advantage of resources when they are available, both adaptations to eating infrequent large meals. This scenario is ideal for an individual animal in transit or freshly introduced to a novel environment, who may need to have the ability to remain motionless without feeding or reproducing for long periods of time. 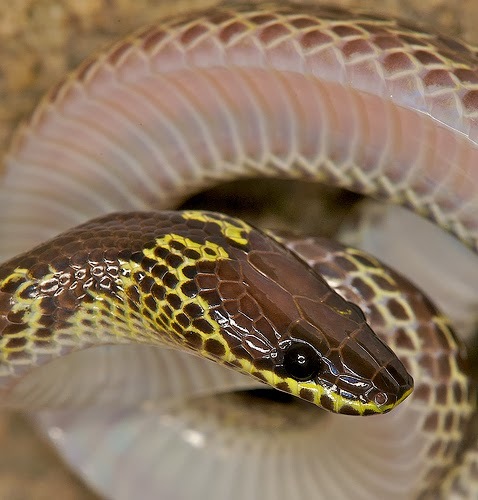 Given snakes' long history with people, it's no wonder that Northern and Banded Watersnakes have become established in California, Aesculapian Snakes in Britain, Cornsnakes in the Cayman Islands, Catsnakes in Malta, Monocled Cobras and Habus in the Ryukyu Islands, and many other examples. Thanks to Rob, Javier Gállego, Aviad Bar, and Jose Zuñiga for the use of their photos.